CHICAGO (WLS) -- A Near North Side doctor's office has found a clever way to get patients in for flu shots. 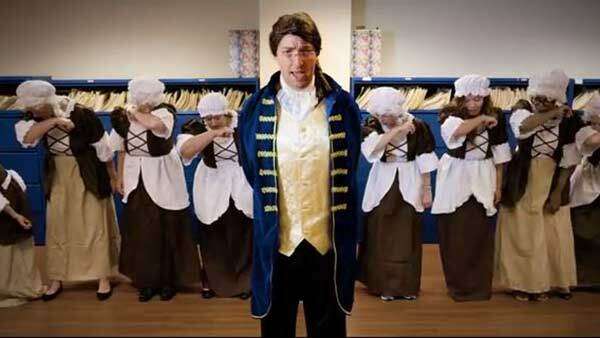 The staff of The Northwestern Children's Practice at 680 N. Lake Shore Dr. posted the video of "Hamilton: An American Musical" parodies on YouTube Monday. It's already been viewed hundreds of times. A character calling himself Alabaster Flumington introduces the video with a song about the demand for the shot, then the team launches into the 10 Commandments of Flu Shots. The video continues with a third "Hamilton" parody song, also extolling the value of the preventive medicine. They say the flu shots are available starting October 3. "Hamilton," the popular Broadway musical opens in Chicago October 19, but previews began Tuesday. The show is sold out for months. The run is scheduled through Sept. 17, 2017. Dr. Scott Goldstein, managing partner of the clinic, said this is the third year they have made a video to get the word out about flu vaccines. Last year it was a Game of Thrones themed video, and the year before it was a horror movie trailer, Goldstein said. Dr. Goldstein said he had help creating the video from a local comedian, who is also coincidentally named Scott Goldstein. Dr. Goldstein said last year's video got over 30,000 views. "Our patients seem to enjoy the humor, and hopefully it will prompt them to get a flu shot. Everyone in the video is either a doctor, nurse practitioner, nurse, or receptionist in the office," he said.